Digital technologies and the Internet are transforming global commerce, including international trade, at a rapid pace. What do future trade policy professionals need to know about the new global digital economy? 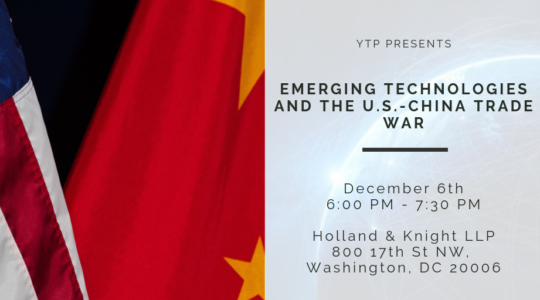 Join us for the second installment of our Digital Trade Series: a discussion of how the race to develop emerging technologies is shaping the U.S.-China trade conflict. What role have digital trade, foreign investment, and innovation policy played in the U.S.-China relationship? What challenges do innovative foreign companies face when operating in China? What steps has the United States taken in response? How will U.S.-Chinese competition impact the development of emerging technologies, such as artificial intelligence and 5G networks? This event is co-sponsored with the Washington Foreign Law Society. Contact events@wita.org if you have any questions about the event. We hope to see you there!